Bella Vista is at the heart of the capital of Panama, with an impressive view to the Balboa Avenue, just in front of Park Urraca. I this privilege location Colores de Bella Vista is emerging as the perfect ambience for success and glamorous business and living. 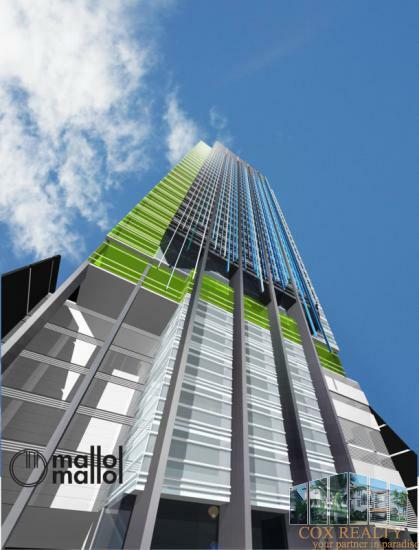 The project is a tower of 35 stories, designed by the world wide famous architect Ignacio Mallol. It has a lounge cafeteria, 24 hours security, 4 high speed elevators, more than 3000 parking spaces and a business center. Fifteen of the floors are for offices and the rest for living units or apartments. Designed with the perfect combination of offices and apartments, its options are based on modular offices of 45 square meters and 90 square meters for some of the floors, and offices of 45 square meters and 135 square meters as well.. Other floors have offices of 180 square meters and 225 square meters that offers a new concept of modular offices that can grow even to 405 square meters. The building is equipped with the state of the art technology, a complete gym and social area. The finishes are of granite and imported ceramic tiles, the best and marble floor in the terraces. The living units start with studios of 90 square meters and go up to 135 square meters and even 405 square meters. The finishes in the living units are porcelain in the floor, a social area with meeting rooms, swimming pool and dressers, as well as marble floor at the terraces. In the halls the walls are covered with marble, the studios have security doors, granite floor in the lobby and in the ground floor, granite counters. As a trade mark of Mallol, the design is a melting of modernism with high tech surfaces.